Longford came away from Black Gates Tullow with a great four try bonus point win to move back into second place in the league and in with a shot of a promotion/relegation play off to Division 1A. Tullow is one of the hardest places in Leinster Junior rugby to get a win and one in which Longford have found the going tough over the years, so coming away from there with a win was a great shot in the arm for Longford with two games left to play in the league and a second round cup clash away to Boyne looming large on the horizon. Longford got the traditional welcome to Tullow as they regathered their own kick off and proceeded to try and batter their way towards the Longford line. They earned themselves an early shot at goal, which drifted to the right and wide. Longford then got the bit between their teeth and played some superb running rugby for the next twenty minutes with great interplay between backs and forwards. On seven minutes Paul Gallogly made a great break, which should have been rewarded with a try but a Longford handling error let Tullow off the hook. Longford kept coming at Tullow and thought they had taken the lead after fifteen minutes only for a Ryan McHugh penalty to come back off the post. However, the men in black were not perturbed and went over for a well deserved try on twenty minutes after the ball was worked out to the wing and was dotted down by Joe McGowan after a great step to go around the last defender. Ryan McHugh managed a great touchline conversion into a swirling wind to make sure Longford were seven points to the better. While Longford showed off their attacking prowess in the first twenty minutes, their showing for the second twenty minutes was all based on strong defence. Tullow monopolised possession/territory and threw the kitchen sink at the away side, including kicking to the corner, trucking it up the middle and moving it wide to the wings. However, despite maintaining the ball over extended phases Longford’s patient well-disciplined defence eventually forced an error to keep Tullow from crossing the away sides line and leaving Longford with a seven point cushion at half time. Longford can be really proud of their defence, which Tullow gave a stern examination to. Longford started the second half brightly and immediately put Tullow under a lot of pressure. It was looking like it was going to be Longford’s day ten minutes in when wing Conor Seery crossed in the corner for another well worked Longford try. This was followed up ten minutes later by a try by Paul Gallogly. At this stage Longford smelled blood and pushed hard for the fourth try, which would give them a winning bonus point and pushed them back into second place, two points clear of Monkstown. It came five minutes later. A superb break up the wing by Shane Rodgers was finished off by Hubie Connolly. Rodgers was caught about ten metres short but popped the ball up superbly to the onrushing Connolly who scored under the posts to bring Longford’s tally to four tries and twenty-two points. The match still had fifteen minutes to go but from then on it had the feel of a match that both sides wanted to wind down without any injuries with both having second round Provincial Towns Cup matches in two weeks’ time. To their credit Tullow ran in a consolation try while Longford never gave up trying to tack on more points. However, there were no further scores and Longford emerged from Black Gates with a very satisfying bonus point win and kept themselves in the running for the prize of securing a promotion/relegation play off to Division 1A by virtue of finishing in second place. Longford Squad: L Brady, P Dardis, D Quinn, B Stewart, B McManus, K O’Gorman, D Farrell, P Gallogly, N Farrell (C), D McHugh, C Seery, R McHugh, S Rodgers, J McGowan, S Flynn, P O’Farrell, P Dardis, D O’Brien, S McGuinness & D Gilmore. Longford Early XV put in a good performance in going down to a well drilled Tullow side today. With Longford out of the running for league honours, it was always going to be about the performance and working through systems and combinations with a view to their First Round Provincial Towns Cup Fixture versus Athy next weekend. The first half was a very close affair with both Longford and Tullow scoring one try each. 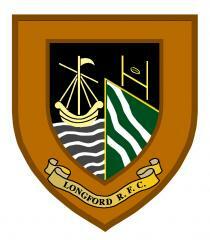 Longford’s was a great try with Lorcan Connolly finishing off in the corner after multiple phases. Longford pounded the homes sides line on a good few occasions in the first half but unfortunately could not convert the pressure into anymore points. One disappointing thing from a Longford point of view throughout the match was not enough heads up rugby being played with the forwards carrying one to many times when the backs had a numerical advantage. The start of the second half was much the same as the first, with Tullow scoring one try, which was quickly followed up by a Longford try by Dean Corrigan to peg the back to 12-10. However, from this point Tullow largely took control and ran in three more tries to run out as the winners. Longford probably should have had a few more scores but unfortunately the final pass was not there. Longford can be happy with the performance against one of the best second sides in junior rugby and with a few tweaks to their shape and game plan will be well set to go down to Athy and earn a place in the second round. Longford Squad: P O’Farrell, P Dardis, J Forde, P Mimnagh, F Davis, D Corrigan, J Geelan, D O’Brien, R Shaw, L Harte, J Mimnagh, S McGuinness, L Connolly, D Connolly, B Hanley, R McCormack, P Kirk, W McDermott & M Casey. “The prep this week for today was good and as coaches we had targeted this as a big one. You don’t go to Tullow and come away with too much, but for the late boys to come away with a bonus point win was a real pat on the back for them. We loaded up training for this one and we think it showed in the two performances out there. And okay the early game didn’t go our way against a better Tullow side than we met in Longford, but the performance was an improvement, and a few individuals have stood up today. The Early team can definitely use today’s performance as a build up for Athy next weekend in the 1st round cup game. Indeed, selection for Athy will be tough as the group are all asking questions of each other and the coaches.